I never did get on the mailboat this morning. I played it safe and stayed home when I started feeling like I was coming down with some kind of bug. I slept and read for the morning and found some energy to work in the afternoon, turning a dumb day into a productive one. 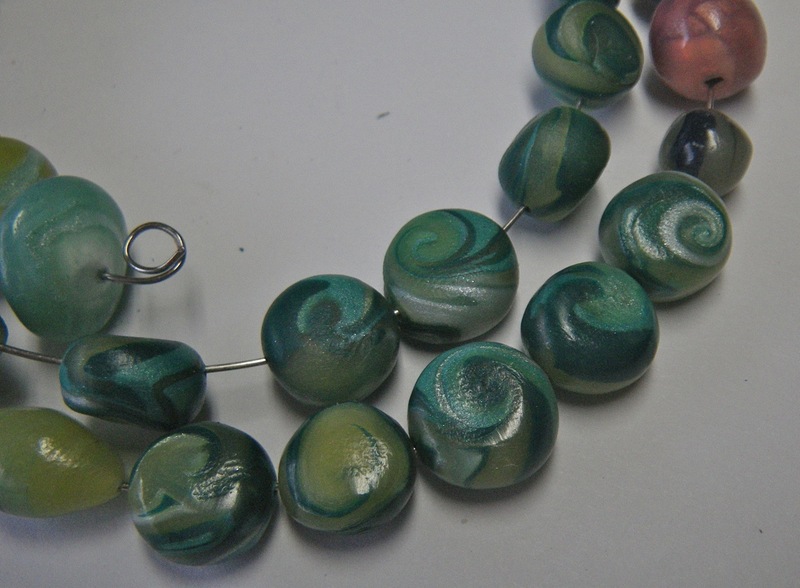 It was easy to feel inspired with ideas when this package of beads from Leese Mahoney arrived in the mail. 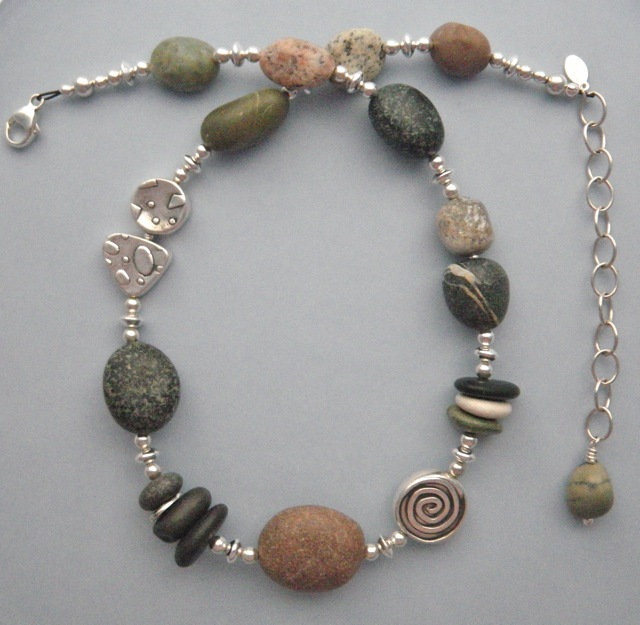 I imagine combining some of the “earthy” rough textured beads with some of my own beach rock beads. I finished up a batch of drilling I had started last week, and waxed and buffed the beach rocks. 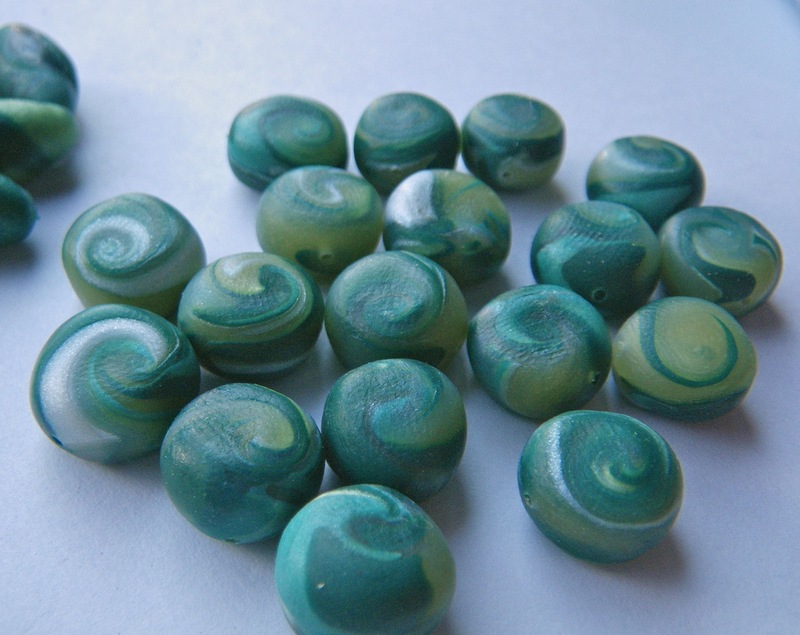 Holly Kellogg asked what the polymer clay swirl beads looked like after they were fired, so here are two photos for you, my buddy Holly! 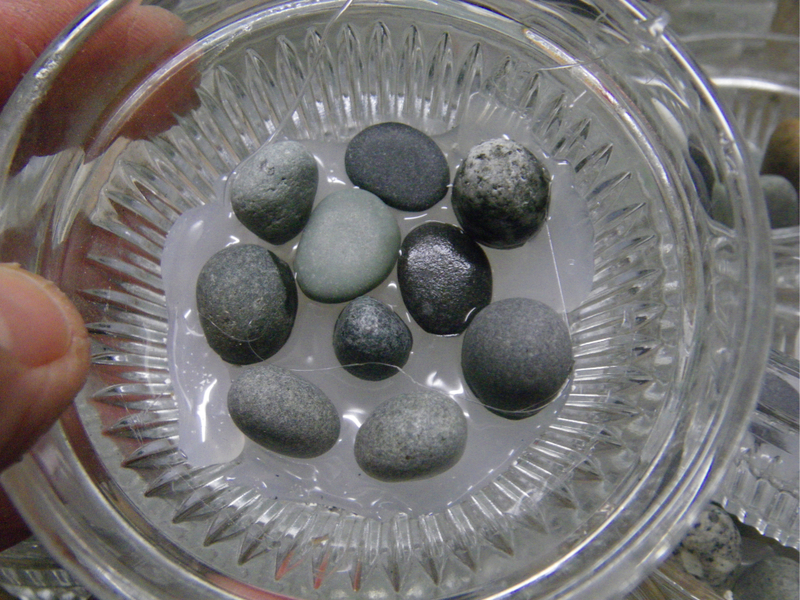 Buffing the beach rocks with a muslin wheel got me wondering about buffing some of the polymer beads. I already had a clean (no polishing compound) buff for the rocks, why not try it on the translucent clay to see how it changed the appearance? 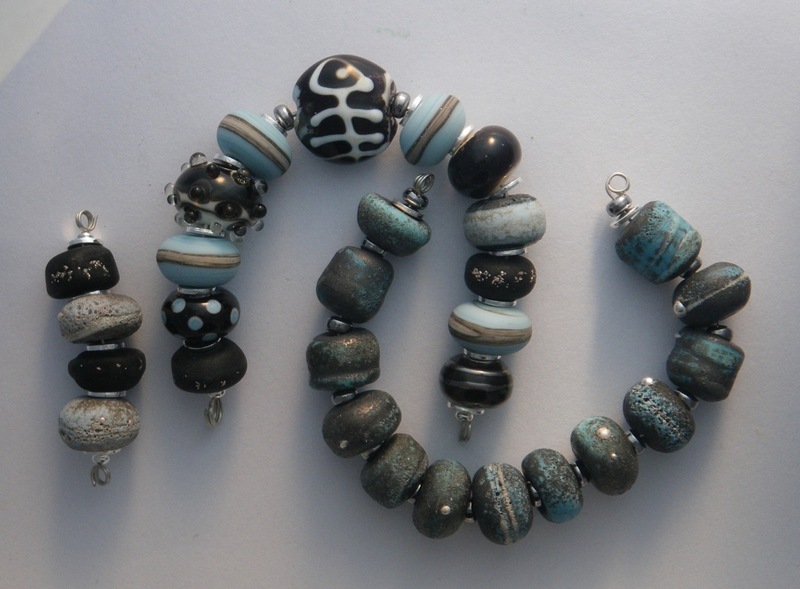 The photos below are late afternoon shot, done in a hurry, but they show the difference between the un-buffed beads (top row) and the buffed beads (bottom row). 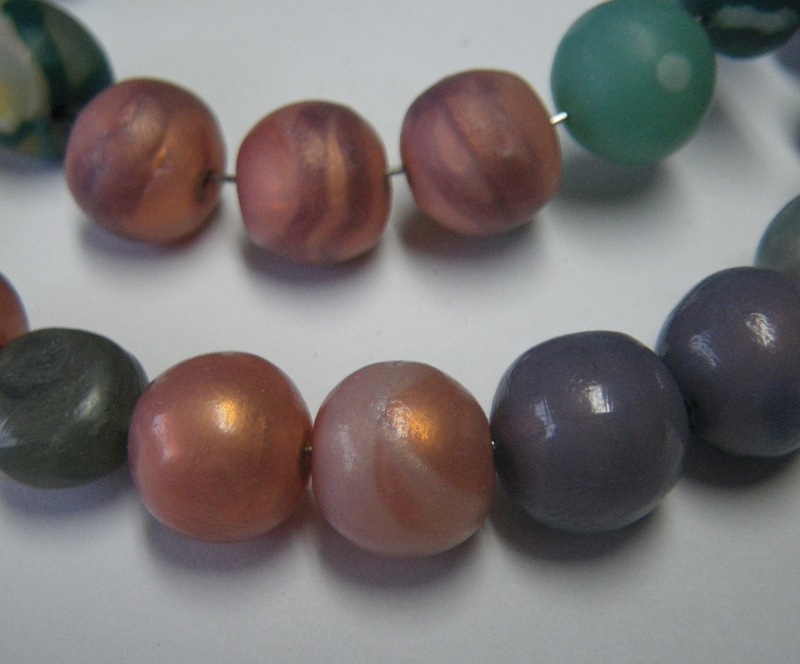 The copper beads I covered with translucent clay were among the most disappointing when I first fired them. After buffing them with a muslin wheel, I really like how they look. 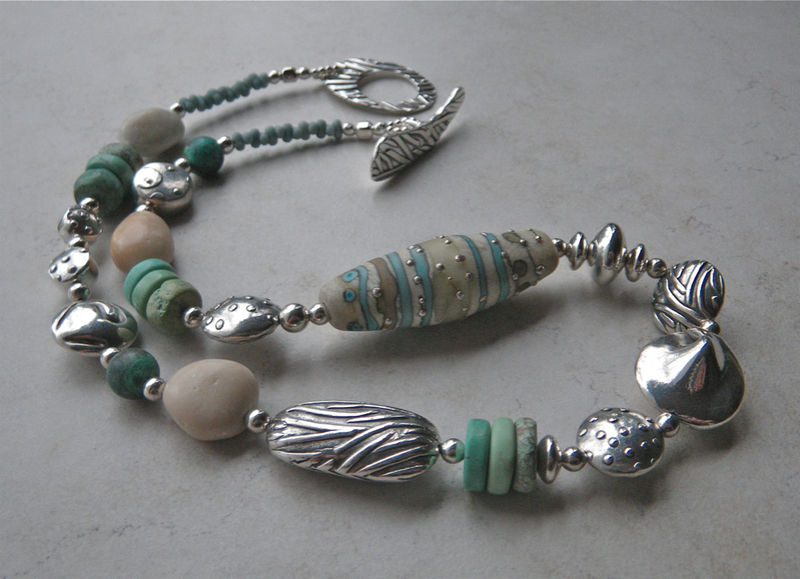 Especially the beads with a little white beneath the translucent salmon. When an experiment changes from something I would not bother to repeat, to something I can’t wait to explore further, that’s a good day. 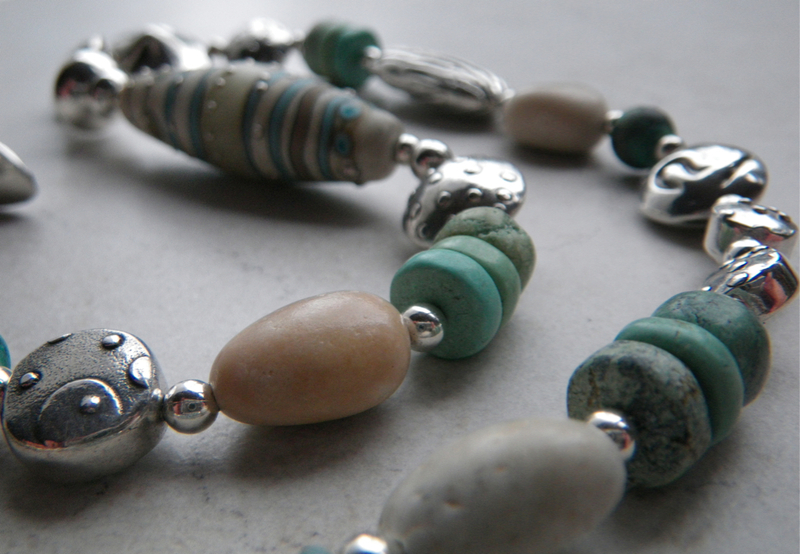 …I start with drilling rocks. After a good two weeks away from my studio, there are so many things I want to do, I am paralyzed by indecision. 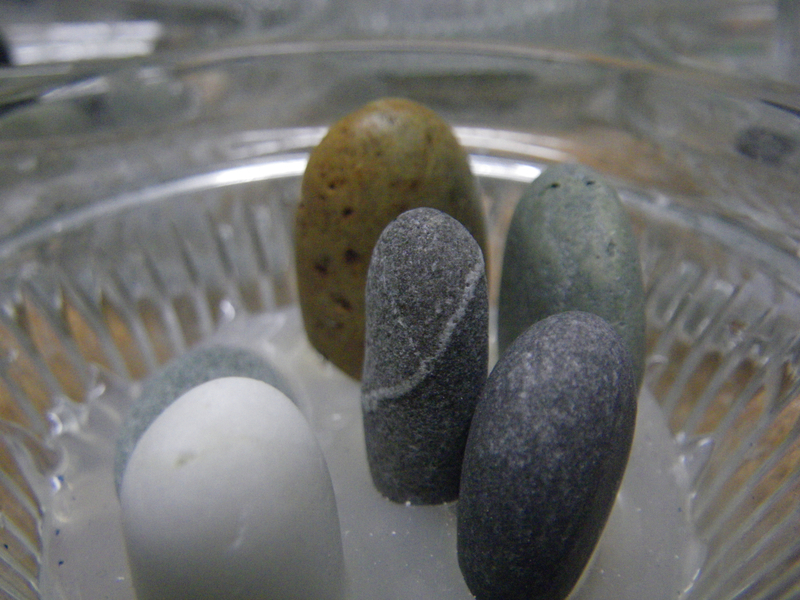 The best thing I can do is drill holes in rocks. I can never have too many to choose from, and it calms my mind to make slow but steady progress on something. 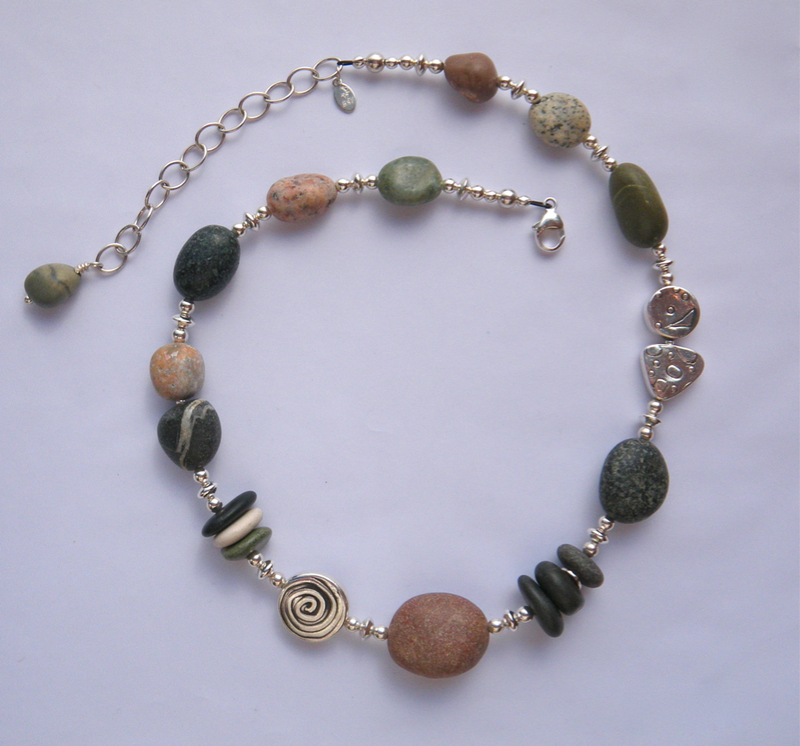 There is not much creativity in pressing the lever of a drill press, peck after peck after peck, to work my way through a beach rock. 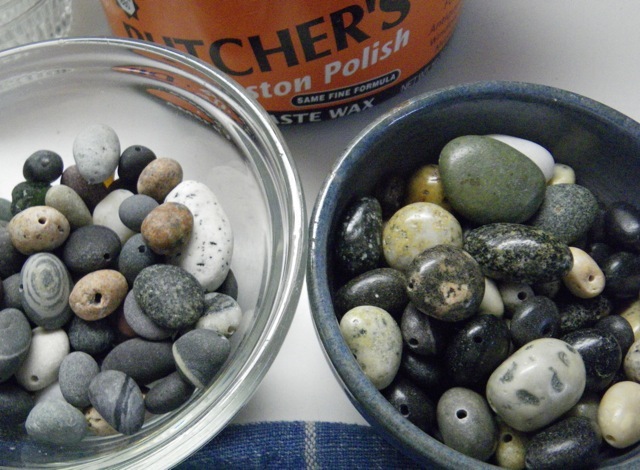 But with each and every pebble I think about how I will use it, or what colors I have to combine with it, or how happy I’ll be to have so many drilled and waxed rocks to choose from when I am sitting down to make new necklaces. By doing something uncreative, I am opening my mind to ideas. 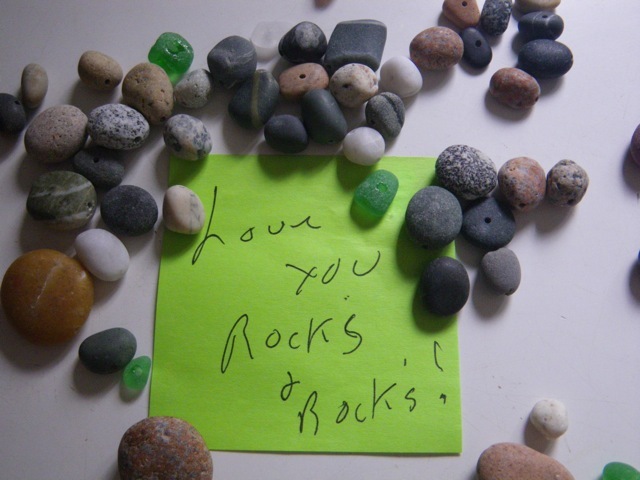 Sometimes there is even a reward to just leaving drilled rocks hanging around on the counter overnight. Alone Moose Gallery , where I have my work in Bar Harbor, is celebrating their 36th year of business with a show. When Sherry e-mailed me last week asking if I was still going to participate in the show, I figured I’d better get going. 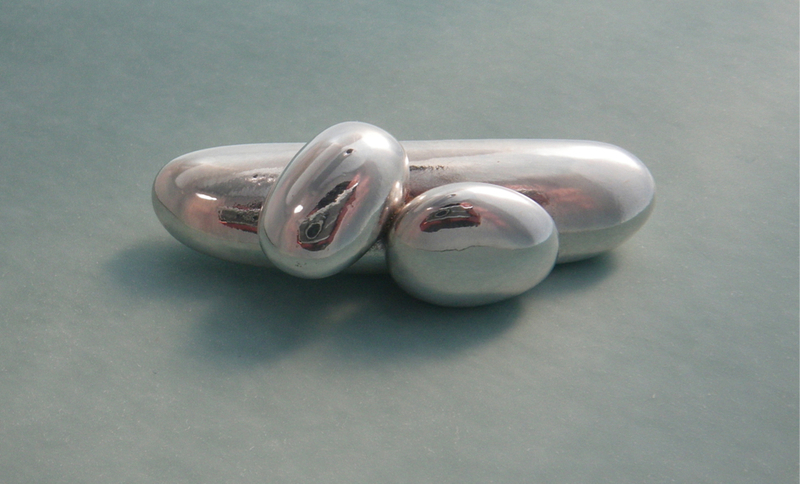 I actually had been thinking about this brooch for a while, but just couldn’t come up with a design until I sat down at the bench with my metal clay. 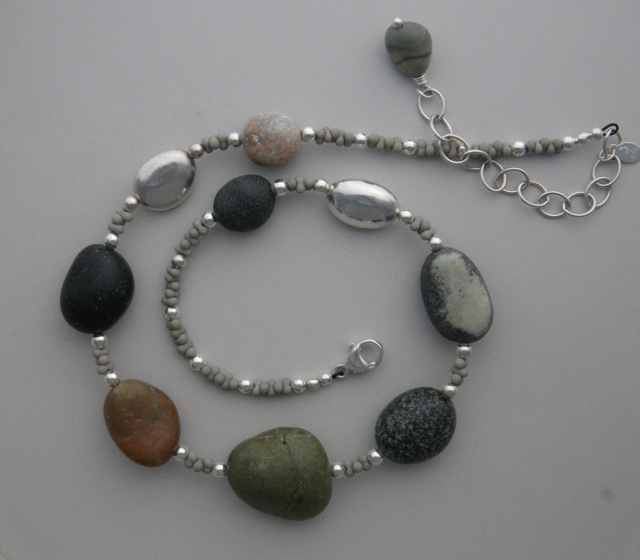 Since beach rocks are a part of my everyday life, I decided to go in that direction. 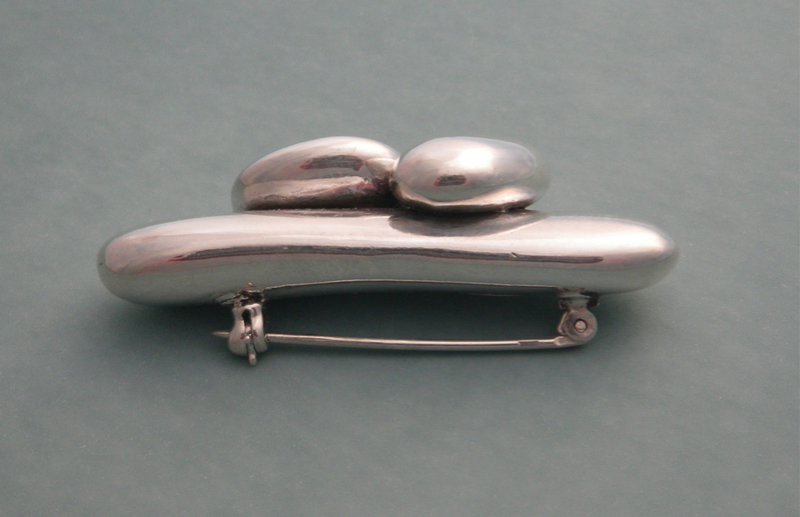 The brooch is slightly heavy; probably more suited to being worn on a sweater or jacket. 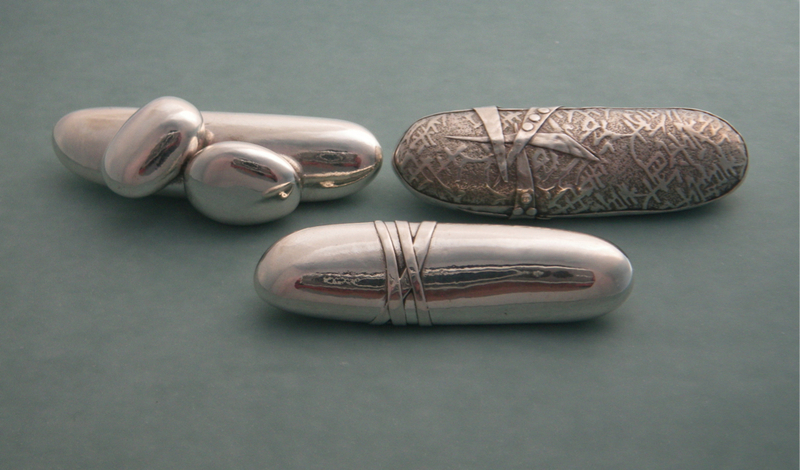 The pin findings are soldered on, but the two smaller rocks were attached and fired in place in the kiln. 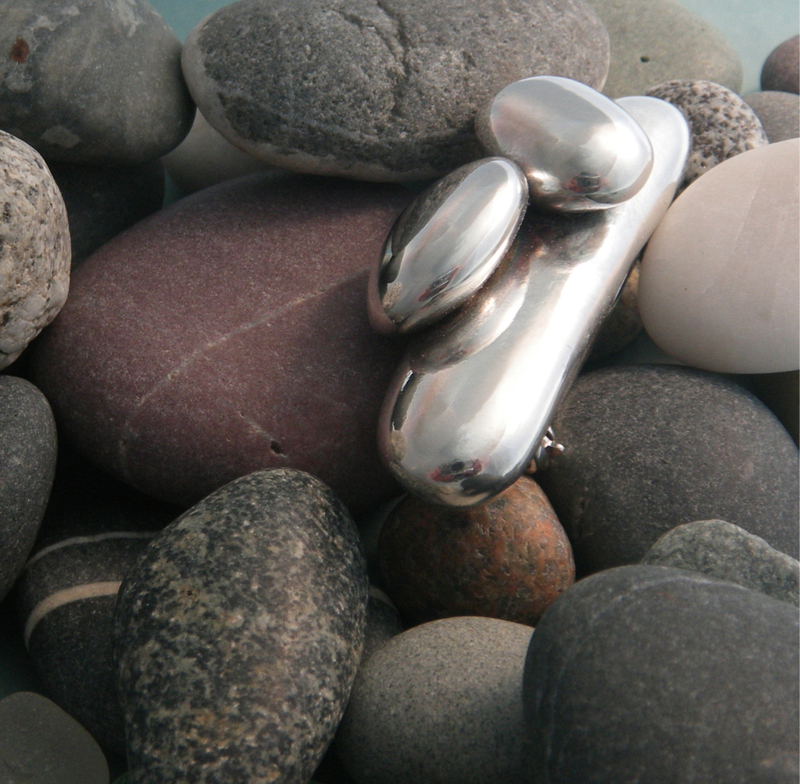 I like the shape of this elongated beach rock, so I decided to explore it a little more. 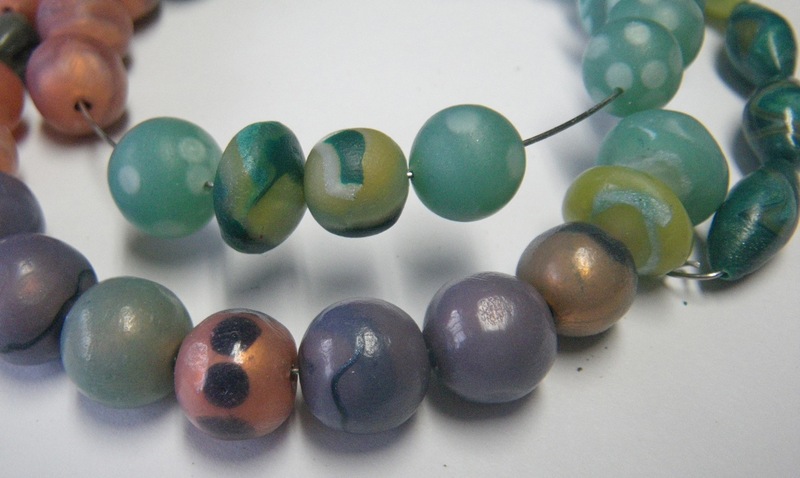 I bought this handmade glass bead at the first PMC conference I attended in 2006, at Purdue University. I wish I could remember who made it. 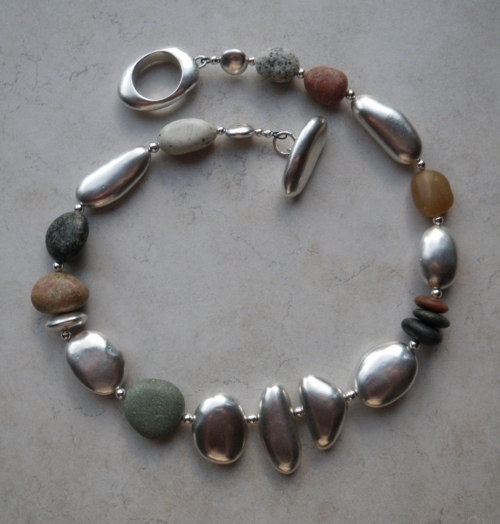 It has bounced around my studio for 5 years, as I have thought about ways to use it in a necklace. 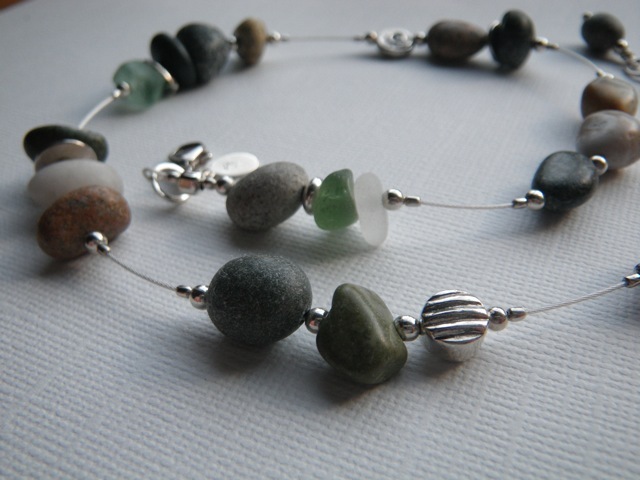 When I started making more asymmetrical necklaces and had a new supply of drilled beach rocks, I brought out the glass bead for another try. 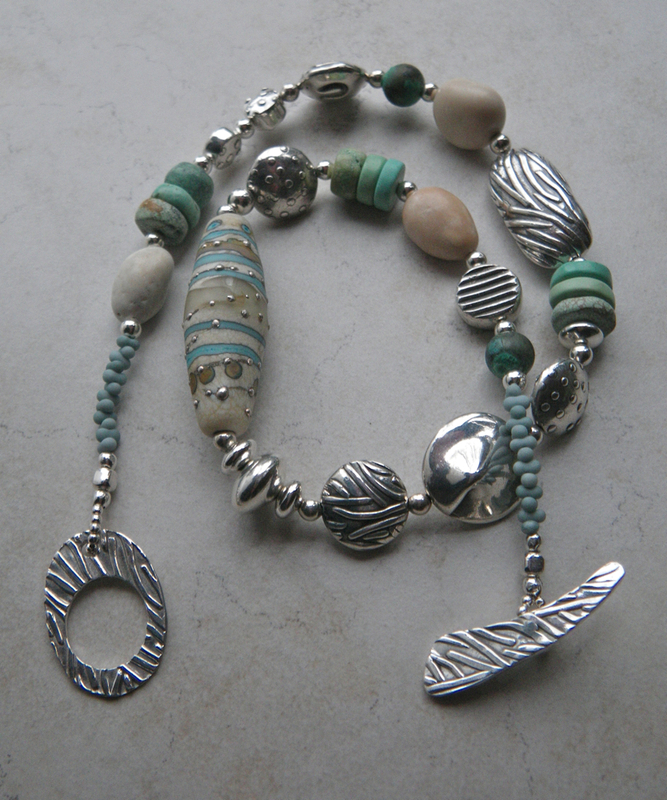 I’m happy with the way the silver PMC beads, the cream colored beach stones, the patinated copper, and the discs of turquoise echo the colors in the glass bead. Today’s post is a short one. I’m visiting my friend Susie in New York and we spent the day looking for a dress for me to wear to my son Robin’s wedding in September. (Hey, after watching the royal wedding we were in the mood!) I scored at the third store we tried. But now we are both tired. Tomorrow, some shopping for lamb sausage, fresh mozzarella, etc. on Arthur Avenue in the Bronx. We may nip into Manhattan for a few hours at the Museum of Arts and Design. We’ll see…. 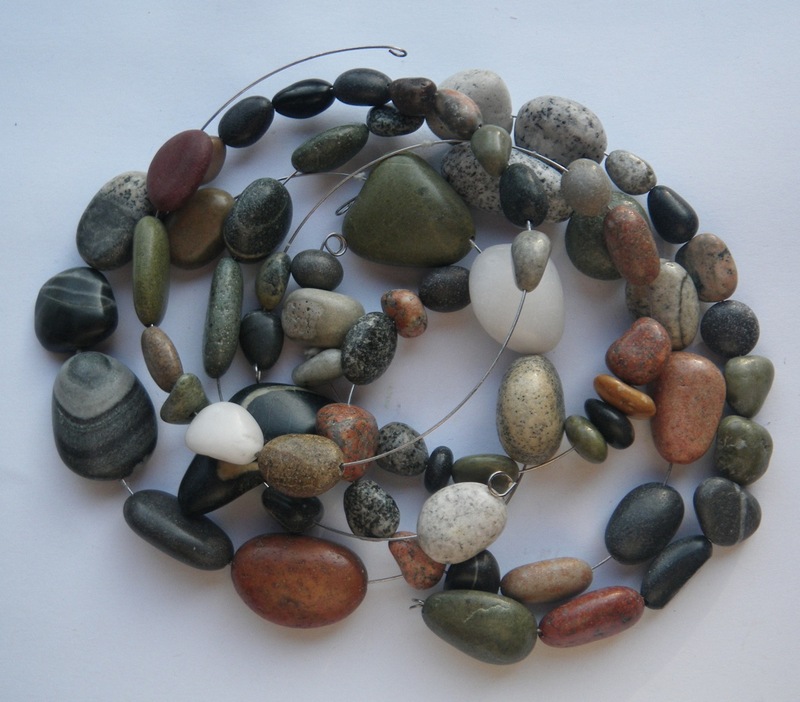 After stringing this beach rock necklace, I decided I did not find it very interesting. Too symmetrical, or predictable. 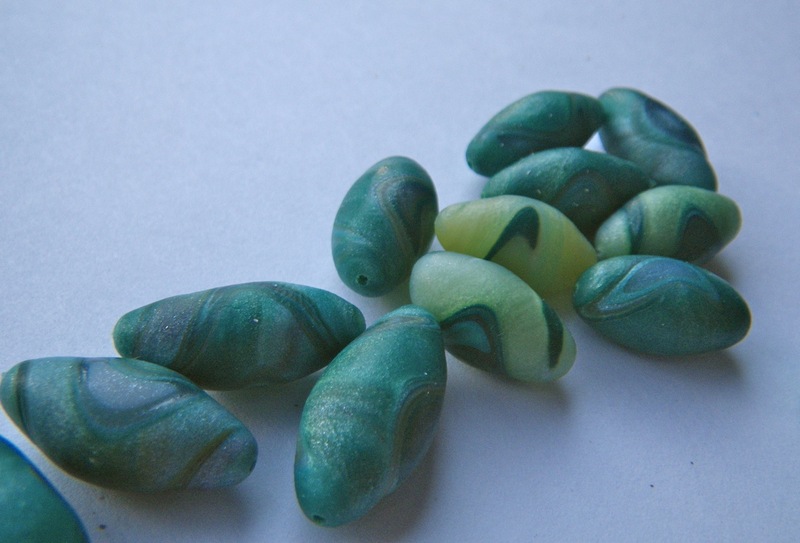 I like the peanut-shaped glass seed beads, but not necessarily with the beach rocks in this design. 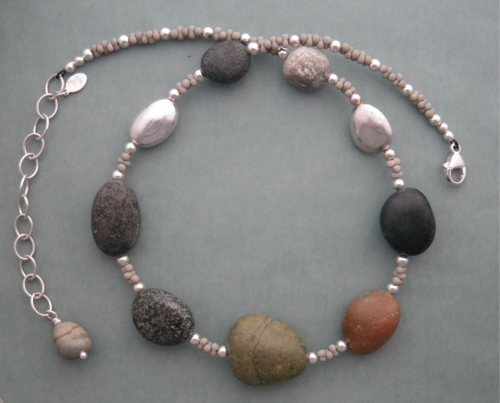 I took the necklace apart and used some of the same beach rocks in a different sequence, with additional beach rocks and different handmade silver beads. I’m a lot happier with this one. 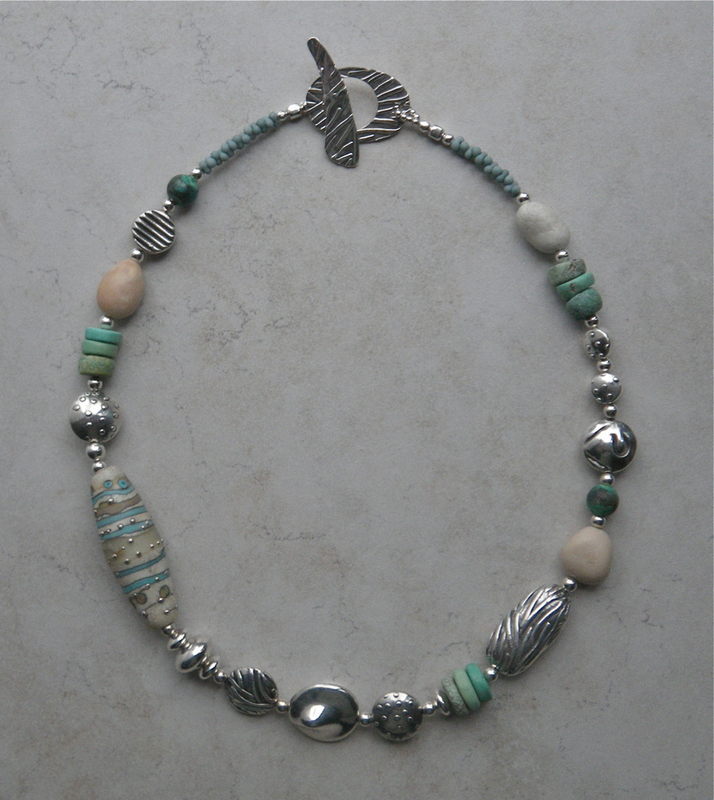 Sometimes I have to make necklaces I don’t like, before I can make the ones I do like. I ran low on my supply of drilled beach rocks after holiday sales, so here is some of the work I plan to do during the weekend. I actually quite enjoy it. 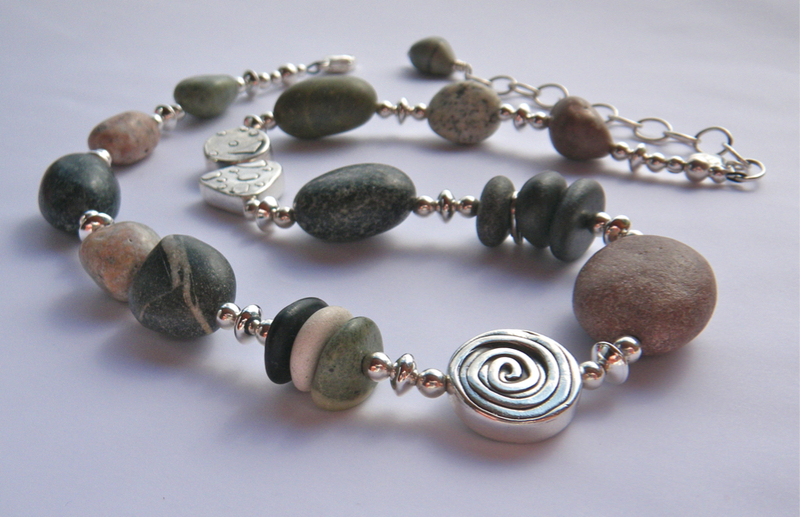 When I can’t find a good block of time to work in the studio, I can always drill rocks to have on hand for future necklaces. I keep a sketch pad nearby because the repetitive work of drilling rocks often frees up my creative mind for new designs. Last September I trained myself to listen to books on CD while I worked in the studio. (I say trained because I have tried listening to books on long car rides and I could never get into them.) For years I have kept a little journal of books I read, so it seemed natural to keep track of the books I’ve listened to as well. Blogging, e-mails and FaceBook have chipped away at my reading time. In the last 12 months I only read 14 books. That seems like a sad small number to me, compared to what I used to read. It was reassuring to realize I had listened to 19 books in just 4 months, bringing my book total for the year up to 33. 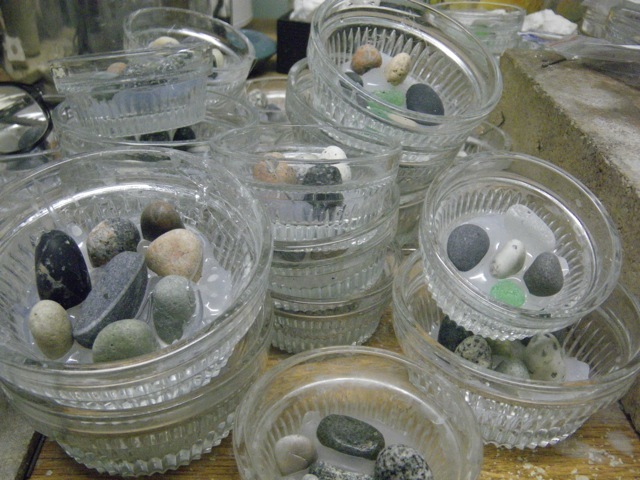 With all of these beach pebbles ready to drill, I could get a lot of “reading” done this weekend. Don't let your photos get lost in Cyberspace! Lorena Angulo makes an important point about tagging your photos. Don't put toggle loops in wrong place!